When Marcus gets the latest version of his favorite video game, “Gorbar and the Valley of the Seven Light Towers”, he tells himself that while his parents are gone during the weekend, he'll finally be able to explore all of its worlds. As soon as he turns on the gaming console and sticks in the game card, a flash of white lightning jumps out of the screen! 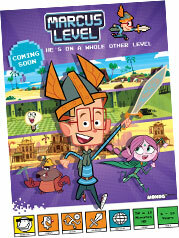 Marcus suddenly finds himself transported inside the video game in the place of his hero Gorbar the Magnificent! It's obvious that things aren't going to be easy neither for Marcus, nor for Gorbar in Marcus' home! Every episode of Marcus Level takes us into one of the worlds of the Valley of the Seven Light Towers!